The Exploring Porosity and Permeability Lab Activity make observing and calculating drainage rates and pore spacing simple. 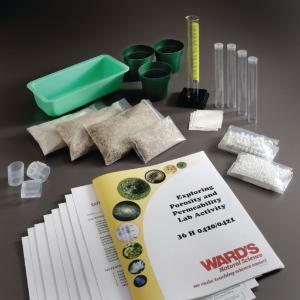 Students use the easy-to-construct models to study drainage and discover the effects of particle size and sorted or unsorted particles on the rate of movement. They investigate the various factors affecting drainage and groundwater movement. Ordering information: The set comes with all lab materials, a teacher’s guide, and student copy masters.